Now comes the longest, and arguably most difficult, portion of making a brick flick. Production. Patience/Time-These are both needed in abundance. Especially at this stage. Computer-Just powerful enough to run the frame-capture software and some basic video/audio programs. But doesn't have to be anything fancy. Camera-Either a webcam advanced enough to enable manual controls, or a fancy digital camera/DSLR. Software- Frame capture programs are highly recommended, but only come free for webcams. They aren't needed with digital cameras, but lacking this step makes things a lot more difficult. A Good Shooting Setup- You want a dark, closed-off room if possible. Plus a few lamps, an open desk, a wall, and a bunch of Lego. 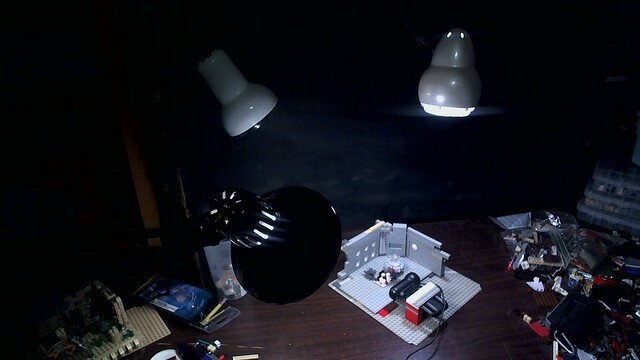 It’s pretty much the same as a normal MOC photography setup, but without an open door or windows letting any light in. A tiny bit of stray light is ok, but too much will cause flickering. So, to animate, you need a studio. Preferable one with a nice, open desk that is backed up to a wall. 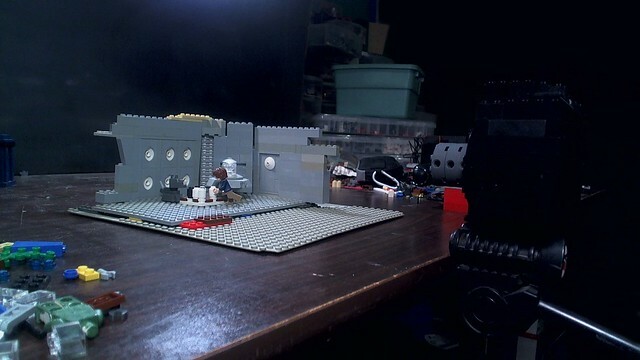 You’ll need just enough room for a few baseplates, your camera, and some lights, but the space doesn't have to be huge. It's necessary to be able to control the lighting in the room, so thick/dark curtains and closed doors are recommended. Here’s a picture of one desk/setup, and as a word of warning, don’t let your desk get this messy! Depending on the scale of your film, it may contain anywhere from one, to a hundred different characters. Each person needs a unique look, voice, and attitude, or they will be confused. Every film needs something different in terms of character design, so the only real tip I can give you is to not just throw a lot of random parts together. Make sure the look matches, is recognizable, and fits the character as well as the film. This is also the stage where you face the dreaded question of "Yellow Vs. Fleshie," as animators on both sides of the debate agree that mixing skin tones generally doesn't match well at all. Taxmaniac has a basic set-building lesson that you really should check out, but there are also some other points you should keep in mind. 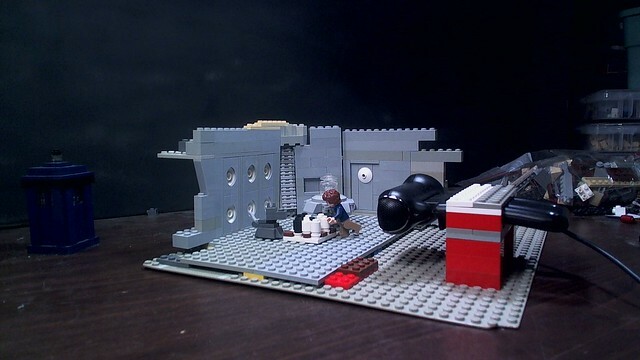 Sets are most similar to dioramas, in that they need to be fairly complete, and are generally viewed from several angles. But sets are different as they are missing key segments. For indoor scenes, they leave out at least one wall so the camera can see into a room, and generally leave out the roof. And for outdoor scenes they generally end in a blue or white wall. The most important thing to keep in mind is what the camera will be seeing. Building extra not only consumes more bricks, but also wastes time and effort better spent elsewhere. And as to the size of your sets, viewers really notice the small details, so it’s better to make a small, but detailed and complex set, than a large basic one. On the other hand, if you have the bricks, build big. There’s nothing quite like a panoramic shot of a huge set. When you are designing your sets, you want to avoid using a lot of the brighter, harsher colors like red and yellow. These are good for what I like calling "Trim work", but tend to overwhelm the viewers when over used. More neutral colors like the grays, black, tan and white are more pleasing to the eye, and also help keep attention on the main focus. (Which is usually the minifigures on-screen.) You also want to avoid the "Random colored wall with holes" syndrome. This is a sure sign of a newbie, and will turn viewers off early on. That being said, your set aesthetic, and film tone should be the main factors in picking how much and how many colors you use. Obviously Fun-houses and Circuses need more bright and shiny bricks than caves or Victorian slums, but just remember what feelings you want the set to give off, and go from there. Again, DarkDragon has a great guide for picking a nice camera. And here’s where things start to split off in between Webcams and traditional cameras. Webcams- You need to make sure it has manual settings, and can take pictures in at least 640X480. You will also need a way to attach it near the set, and something to keep it from bouncing around. For that, you need a webcam cradle. The design will need to change slightly depending on the exact model you own, but here’s the basic part. The camera needs to be held in there somewhat firmly, as a loose cam can cause havoc later on. DSLRs- With these, set-up is slightly more difficult. These cameras are much too big and heavy for a Lego cradle, and are too unwieldy to place directly on the animation table, so a tripod is necessary. You’ll just need to get your set closer to the edge of the table, and get the tripod as close as possible. The downside to this is if something gets bumped, it’s easily noticeable. Now, once you have all of that ready, consult your storyboards and see where the camera needs to go. And don’t worry if you can’t get things exactly, storyboards are meant as a guide, not as an exact rule. Most beginners tend to elevate the camera above the characters. This causes the viewers to “Look down” on the world, and destroys the illusion of being in the world. Keep things about face-high on the figures. Again, depending on the storyboards and angle choices, you may want to/need to elevate the camera, and that’s fine. But as a general rule, keep things about face-level. Lighting plays a huge part in setting the mood and atmosphere in films. It’s also one of the easiest ways to tell beginners from long-time pros. To start out with, you’ll want a three light setup. With at least one on each side of the set, and then another for the background, or for getting the outer edge of the set. I usually have mine positioned like so: #1, slighting behind the set, #2, on the other side of the set and about at the same level as the set, #3, a foot or two out, and about centered at the set. This gives a fairly even lighting spread, and helps eliminate highly-exposed spots. 1. Make sure the lighting is fairly even, you don’t want to have one corner of the room glowing, and the other pitch black. One way to do this is to either ‘bounce’ the lighting off of a white surface onto the set, or wrap white paper over the lamps to help diffuse the lighting. 3. Return to about the same spot each time when you take a frame. Especially if the computer is near to the set. Even if there’s a tiny bit of stray light, it can be affected by your moving around in between each frame. 4. And I’m just going to say it now, turn EVERYTHING to manual in your camera settings. Top Row: Pritchard Studios-"Batman:Plastic Justice", Repelling Spider-"Don't Blink", NickDurron-"Abduction 5." Bottom Row: Dual Digital-"The Button", AnnoyingNoisesInc-"Sharks and Clowns", MightyWanderer1-"Star Wars Uncut-The Empire Strikes Back: Scene 416"
Getting special lighting effects is actually quite easy. Anything from a flashlight, Christmas lights, or even the screen of your phone/tablet/computer will work. 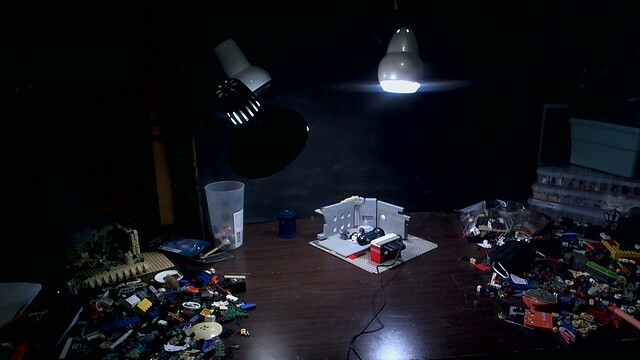 Sticking a light source behind some clear bricks really adds a lot to the atmosphere of a set. And if you want colored lighting, it's as easy as getting a picture onto your device of choice that's all one color, and then blowing it up to full screen. Don't forget, colored/Dramatic lighting can really add to a film, but it's not good for everything, and can be over-used. This is one of those points were you can either go the free route, the cheap route, or the pay-out-of-your-nose route. Webcams are a lot better off at this stage, but DSLR users can still animate for free. Webcams-Assuming you got a Logitech webcam, you’ll have the have the handy-dandy “Logitech Webcam Software.” This includes the webcam controller that you’ll be using to adjust all of your settings. Be sure to go into the “Advanced settings” tab, and turn off all those pesky automatic settings. Other brands should have something equivalent. DSLRs- These should all have a manual setting. As well as piece of software from the manufacturer. Depending on what software choices you make, you may not need this one. Note-You don’t need a capture software program, as the respective camera software can do a bit of the job, but it’s very highly recommended to get something else…At least for webcam users. Webcams-There are a number of free, relatively bug-free programs available, with Monkey Jam and Helium Frog being the most popular. While Helium Frog has an arguably more professional look, and has Onion-skinning, it’s a bit more buggy and unreliable. DSLRs-Well, there aren’t any free options besides ditching the animation software. (Which quite a few have done with success.) StopMotionPro and AnimatorHD are two mid-level pieces of software, but there’s also the popular (And very expensive) Dragonframe. So, you've got everything set-up, turned-on, downloaded, installed and ready to go. Now it’s time to animate. I’m sure you've seen the letters “FPS” before, and in the video/media world they mean “Frames Per Second”. Real live-action movies are typically in 24 FPS, and some brick flick creators do so also, but 15 FPS is more common for several reasons. It’s high enough to achieve smooth motions, but low enough to keep production form taking a long time, it doesn't take up as much memory on your computer, and renders faster. Anything lower, (Say, 10FPS) yields a choppy image, and ruins the "Moving picture" aspect, replacing it with a fast moving slide show effect. While all of the examples below will be 15FPS, but the basic principles can be applied to any frame-rate. With a capture program, you'll just need to look for an obviously named big handy button. Click that, and you'll "Capture" or take the frame. If you're not using a frame-capture program, but instead using the camera's software with a live feed, again, just click the capture button. if you're using a DSLR, and don't have live feed to a computer, you'll have to compare the frames on the tiny screen, as well as capture using either the button on top, or a remote. Clicking the button will move the camera ever so slightly, and that will result in major camera shaking later on, so a remote is highly recommended. There are three really big things that are usually forgotten in early attempts at walking. First, Arm Movement. People rarely walk with their arms straight down in real life, and that detail needs to be in the animated world. Second, the “In-between Frame.” A frame where the figure is balanced between the studs. This helps the transition from stud-to-stud greatly, and is necessary for a smooth walk. Third, Keeping the torso/head at the same level and angle. If the head moves around and the body changes angles, you’ll get a jittery effect that is distracting and unrealistic. As you can see, the amount the arm moves varies in each frame. The arm starts out with tiny movements, and then speeds up as it goes along. The movements then begin to get smaller and smaller and the arm stops and ends the movement. And that, is 'easing'. A common mistake newer animators make is to either neglect easing altogether, or use it improperly. To put it simply, you want to ease into and out of EVERY motion. Regardless of who or what is moving. It takes a lot of practice, but once this skill is mastered, your animation quality will skyrocket. A good starting rule is to ease "halfway". Meaning for each frame you are easing in, you want to double the length the object moves each frame, and for easing out, you want to half the movement in each frame. Talking animation, while commonly used, is at the same time one of the easiest things to do, and one of the hardest to master. Many animators to a poor job of balancing the amount of gesturing with still talking. And by "Gestures" I mean something like an arm raise, a hand twist, slight tilting of the body, or some combination of those. Most err to the side of relying on several seconds with of still frames, making the scene boring. While others gesture for nearly every word and make the characters look like hyper-active. A good balance is two to three gestures per sentence, but a character's personally and attitude should also be reflected in the number and types of gestures used. These follow many of the same principles of easing as do normal movements, but come with different difficulties and benefits. Camera movements add considerably to a film, and greatly increase the cinematic aspect, but add yet another challenging layer to remember while animating. When panning or zooming a webcam, it's best to build a track for it to slide along, since matching each frame by hand prolongs the process and leaves more room for error. This can be as simple as a few tiles laid in between a few bricks, but any number of rigs can work depending on the movement that it needs to follow. DSLR's require either much larger rigs, or the "Pick up the tripod and move it a tiny bit" method. A common issue with these is the sheer speed of the movement, the choppy-ness of the shot, or the inconsistencies of the camera's location between frames. Practice makes perfect, and as with all aspects of animation, don't be discouraged if your first few attempts aren't quite perfect. Ah yes, special effects. I'm not going to go into much detail here, and will only cover the very basics. This will teach you how to set up for effects shots, but we'll be doing most of the work on them later in post. This is the erasing of part of a frame, while leaving the rest. It's used when you want something to fly/jump, or want to take out supports, or that annoying dog hair, or just about anything you don't want in the frame. There are two ways of doing this, and both need a "Clean shot" other-wise known as a frame or two with nothing on the set. Or at least nothing that moves in the shot. Let's assume you need a mini-figure to jump. You'll want at least one frame of the blank set, this will be your background plate. You then animate the shot normally using bricks or a special rig to hold up the figure. Later, in post-production I'll show you how to erase the rig using the background plate. Shots with masking AND a moving camera are possible, but you'll need a background plate for each frame. The lighting needs to be as close as possible in the plate as the real shot, or the effect will be noticeable. Assuming for some reason you can't or don't want to mask a shot, or it's something that just won't work with a mask, you can use a green-screen. This effect is also useful for set expansion/extension and windows if the outside view can't be done in-camera. You take a shot of the object in front of a green background, (Or any color background, just as long as said color isn't in the figure.) then in post you'll remove the green and put the figure onto a different background. The green part (Be it paper, cloth, or a wall) should be as far back from the foreground element as possible, as that will prevent "Spill" or the element reflecting the green and either getting erased later, or easily noticed. The green-screen needs to be evenly lite, and free from wrinkles/or slight color variations. If you're trying to decide between masking and green-screen, remember this tip. If you want to erase a little, and keep a lot, go with masking. If you want to only keep a little bit, and loose the rest, go with green-screening. I know, ya'll all want to know how to make the lightsabers glow, well, for filming you'll just film with the usual transparent rod, and we'll add the glow in post. Moving on, for guns, have the character react to the gun's kick like normal, and use a flashlight to simulate the gun's flash. The flash only needs to be in a few frames, but that will drastically increase the realism of the shot once the muzzle flare/laser added later. And if the flashlight's light splashes off onto the set, that's even better. The same principles apply for explosions, just add a flashlight in the appropriate frames the it becomes all that much more real. This is stuff like crowd shots, long cuts with many camera movements, a wide shot with lots of action, a complex effect shot, or simply something that's really hard to do. Beginners should avoid these until they have a basic understanding of the pillars of animation, and are ready for a harder challenge. With more difficult shots like these, you may very well have to do several takes to get something usable. But don't worry, the extra time and effort are always worth it to get a quality short. Assuming you've been using a frame-capture program, the final step is to render the completed clip. A common format used is uncompressed .Avi. It's a bit big, but has great quality, and will be compressed later on. With MonkeyJam, it's as easy as clicking the render button and making sure the settings are all good before saving the file. With Helium Frog, you'll need to get the setting all set and saved before you begin animation, but once they're saved once, you'll not have to mess with them again. Other programs are similar, but you'll just have to check all the settings and preferences and set them correctly. While you're welcome to use whatever naming scheme works for you, I use one based on numbers. For example: "5.9" would mean it's the ninth clip for Scene 5. That way i can keep things in chronological order, and it helps to keep them organized. If you're using a DSLR, or simply not using a frame-capture program, you'll be saving each individual picture, and not saving it as a video file. Thankfully, pictures can easily be strung together. One way is to simply import the pictures into Monkeyjam, then, not only can you preview the video, but you can render it easily into the format and resolution of choice. VirtualDubis another program that can very easily string picture together, but it's a bit old and doesn't always work with newer file formats. As has been stated, if your first take just doesn't look right, or there's a major flaw, don't feel bad. just do it again. It's easy to spot film where the creator obviously went with the first thing that came through the camera, and they suffer for that. While you may never reach perfection, if you can do better, there's no reason that you shouldn't. Thankfully, capture programs have a handy preview feature that you can use to check for any mistakes before rendering. You remember that script you wrote last time? Well, now you get to animate it. But I’d also like to see behind the scenes pictures of your studio. So the assignment is this: Animate the script that you had written using techniques and tips learned here. Provide several behind-the-scenes pictures of the set-up, and list the equipment and software that you used. You will need to put the film on YouTube for me to see it, (Well, any video sharing website will work.) but I don’t want it to have any sound, music, or fancy titles. Just the animation, and if you want, a bit of titles at the end. What I’m judging is the animation, lighting, and any aspect of the raw footage that could be improved. KielDaMan did a basic Windows Movie Maker tutorial that you can reference to get your animation clips together and online. Judging will be on animation, set and lighting quality, and mastery over containing/eliminating light flicker and other common problems. I've been all over looking for advise like this, thank you much! Wow, I learned so much about stop-animation from this. Thanks for sharing, this is a gold-mine of information. Glad ya'll could get some use out of them. But are you also considering doing the lessons? Just think, doing both could earn you a fancy-schmancy tag! Yes i am. Actually, I'm in the middle of it right now. I'm doing my first stop motion film (I likely bit off way more than I could chew). I'll send you a link for some early work!